PSALMS 118:6 KJV "The LORD [is] on my side; I will not fear: what can man do unto me?" 3Let the house of Aaron now say, that his mercy endureth for ever. 4Let them now that fear the LORD say, that his mercy endureth for ever. 5I called upon the LORD in distress: the LORD answered me, and set me in a large place. 6The LORD is on my side; I will not fear: what can man do unto me? 7The LORD taketh my part with them that help me: therefore shall I see my desire upon them that hate me. 8It is better to trust in the LORD than to put confidence in man. 9It is better to trust in the LORD than to put confidence in princes. The Lord is on my side, I will not feare: What can man doe vnto mee? 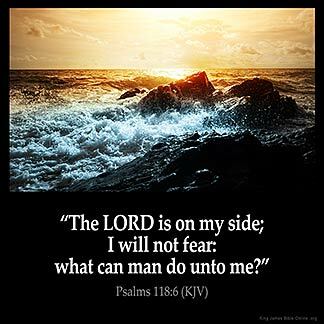 Jehovah is on my side; I will not fear: What can man do unto me? The Lord is on my side; I will have no fear: what is man able to do to me? Jehovah is for me, I will not fear; what can man do unto me? The LORD is on my side; I will not fear: what can man do to me? Yahweh is on my side. I will not be afraid. What can man do to me? Jehovah [is] for me, I do not fear what man doth to me. The LORD is for me; I will not fear; what can man do unto me? Amen I can feel of enough protection. When the Lord is on my side and He always is : Then I will not fear . nothing that man can do to me that my Lord will deliver into mine hand : I will not fear : There be more with me than with them : They the arm of the flesh : I , the Lord and an host of angels : Praise God Victory and boldness in the Lord !!!! AMEN if GOD is for us no one can be against us,HE WILL make our enemy be at peace with us, so let approach everything with great hope without fear. It gives boldness to believers who trust in God.